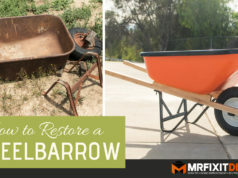 It’s no secret that pallets are the go to reclaimed wood source for DIYers and rightfully so. Their abundance, free or low cost of attaining, and versatility for projects make them perfect for makers like us. I personally LOVE using pallet wood and I think I’ve made some pretty cool stuff out of them thus far. But working with pallet wood for your projects can also be very dangerous. Now before you accuse me of blasphemy and shun me for life, hear me out. Pallets are used to transport almost anything, from food products to fuel and chemicals. They’re also used and re-used, and shipped all around the world. It’s no surprise that they are made to last and hold up to the abuse of shipping and carrying heavy loads. However, they’re also often left out in the elements so they need to be resistant to wear and tear, the weather, and insects. Here’s where the problem comes in. Manufacturers of these pallets typically treat the pallets either chemically or with heat in order to make them more resilient. There is A LOT of information out there about sourcing where pallets come from, who produced the wood, and how they were treated; however, I’m going to try and condense a bit of info for you to try and give you a crash course for your projects. The general rule is that if a pallet is heat-treated it is safe to use. If it is chemically treated, it is not safe to use. First and foremost when using pallets for your projects, always look for any markings on the pallet that can help identify the source of the pallet and the method in which it was treated. 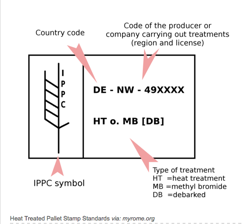 The International Plant Protection Convention (IPPC) has outlined a labeling system for international pallets, which is required on newer pallets to help identify the pallet. Here’s an example. HT: This means the pallet has been heat-treated which heats the core temperature of the wood. Pallets labeled with HT are safe to use. MB: This indicates the pallet has been chemically treated with the insecticide Methyl Bromide and is not safe for use in your project. DB: This indicates the pallet has been Debarked meaning the bark was removed using a cutting tool under IPPC standards. If used in conjuction with MB the pallet is unsafe. If used either alone or with HT the pallet is safe. KD: (Not shown) This indicates the pallet is Kiln Dried. Kiln dried pallets are not harmful and are safe to use for your project. Here’s an example of a label on a pallet. Can you identify it? 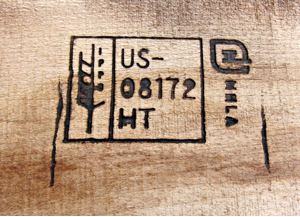 US: Country Code – This indicates the pallet was manufactured in the United States. HT: Heat-treated meaning it’s safe to use in your project. Traditionally many pallets contained CCA (Chromated Copper Arsenate), which was used extensively as a preservative in the wood; however, testing revealed that the arsenic contained in the chemical compound could leak from the wood and cause problems. More recently, chemically treated pallets have been treated with Methyl Bromide [MB], which is regulated as an insecticide in the United States. Internationally, many countries have outlawed the use of Methyl Bromide in their pallets. Many European nations for example have added it to a list of chemicals to be completely phased out. However, there are still a lot of chemically treated pallets floating around out there that may cross your path. THAT’S ALL GREAT BUT WHAT IF I CAN’T FIND A MARKING? Sometimes there’s just not a marking on a pallet or the marking has been worn off via wear and tear. It could either be a pallet that is used for domestic transport and is not treated with any chemicals, or it could be that the marking has been worn off. I’d urge you to err on the side of caution in this case and make sure if you choose to use the pallet that you protect yourself with a respirator and safety equipment. 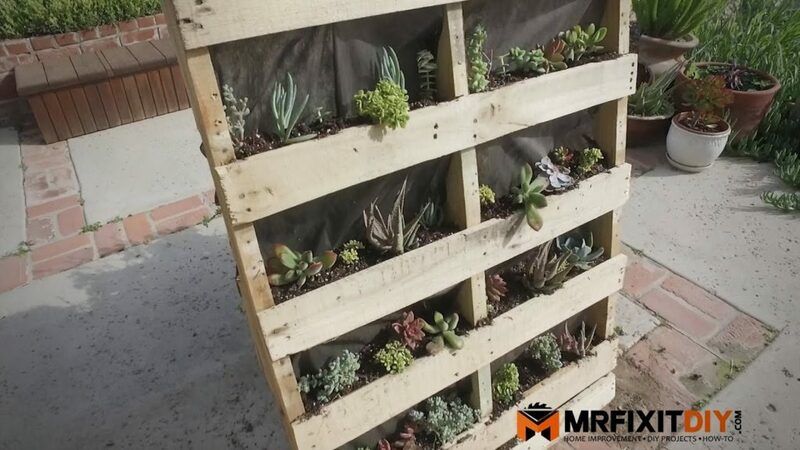 This is by no means an attempt to scare you away from using pallets in your projects, just a warning to protect yourself and your family first. 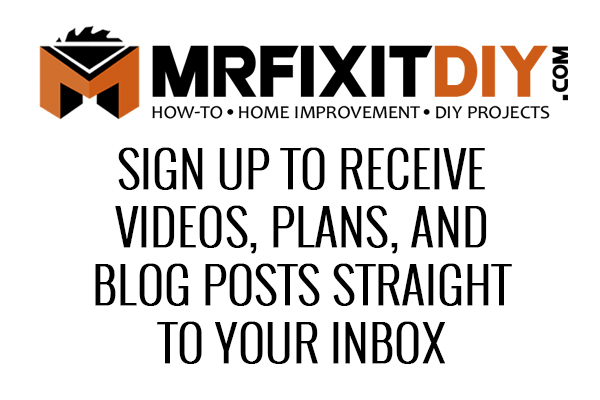 The bottom line is that if you can’t identify the pallet as heat-treated or kiln dried, it might be in your best interest to steer clear of it and find something else. 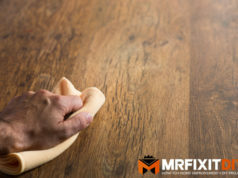 If you absolutely must use the pallet you have despite the fact that you don’t know if it’s been chemically treated, make sure you protect yourself when cutting, sanding, or working with the wood by wearing a respirator (not a paper mask), gloves, safety glasses, etc. 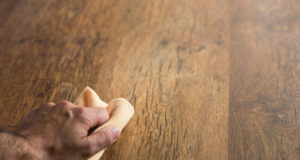 I’d also recommend that you use a polyurethane or some other type of thick sealant to seal the wood when you’re done. If you’re working on something that will be used as a food prep surface, children’s toy or furniture, etc DO NOT use a pallet you can’t identify first. 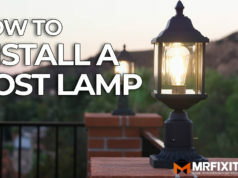 Hope this info was helpful and best of luck on your upcoming pallet projects!